Heat oven to 350°F. In large bowl, beat 1 1/2 cups butter with electric mixer on high speed until creamy. Beat in sugar and vanilla. On low speed, beat in flour until blended. Divide dough in half. Between 2 sheets of waxed paper, roll 1 portion of dough to 1/4-inch thickness. Cut with 2 1/2-inch round cookie cutter. On ungreased cookie sheet, place cutouts about 2 inches apart. Repeat with second portion of dough. Bake 12 to 14 minutes or until set and just barely light golden (do not overbake). Remove from cookie sheets to cooling racks; cool completely. In medium microwavable bowl, microwave caramels and milk uncovered on High 2 minutes 30 seconds, stirring every 30 seconds, until melted and smooth. Frost each cookie with about 1 rounded teaspoon caramel mixture. In small microwavable bowl, melt chocolate and 1 tablespoon butter uncovered on High 1 minute 30 seconds, stirring every 30 seconds, until melted and smooth. 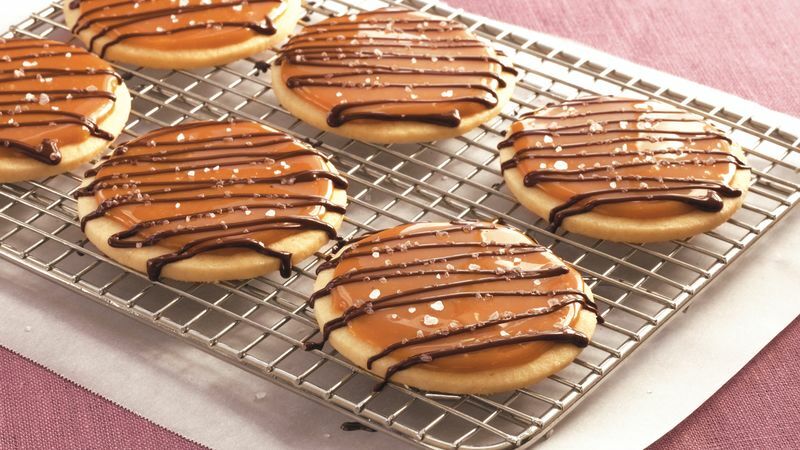 Drizzle chocolate over caramel on each cookie. Sprinkle generously with salt. Let stand until set. If desired, substitute 1 can (13.4 oz) dulce de leche (caramelized sweetened condensed milk) for the caramels and milk. Spread each cookie with dulce de leche and proceed as directed. You can omit the coarse salt on top of the cookies and instead add a dash of salt to the cookie dough. For a quick and easy way to drizzle the chocolate, spoon melted chocolate into a small resealable food-storage plastic bag. Cut off a tiny corner of the bag and squeeze bag to drizzle the chocolate evenly over cookies.